University has already shared the examination programme with group-wise subjects list and the first examination is on 8 December 2017. In this post, I am going to cover each and everything related to LNMU PG Second Semester Examination, Updates related to Admit Card and etc. Students are highly recommended to check the official website of University lnmu.a.cin for further updates on LNMU PG 2nd semester examination 2017. Candidates can fill their online applications till 28 November 2017 and after that, they will have to pay extra fine with the regular fee and that too, till 1st December 2017. After that LNMU PG Semester 2 Admit Card 2017 will be released and it will be organized in the 4 districts - Darbhanga, Samastipur, Madhubani and Begusarai. Examination routine is already released by the University and it will be conducted from 8th December 2017 in 2 sittings. First sitting will be from 10 a.m. to 1 p.m. and another one will from 2 p.m. to 5 p.m. Also, LNMU has released the name of centers of all 4 districts in which the examination will be conducted. In below section, I will share all the Informations an appearing candidate need like How can he apply the form, LNMU PG Examination routine and Updates related to Download PG Semester 2 Admit Card 2017. According to the notification published on the official website of LNMU, Last date of filling examination form is 28th November and after that extra fine will be charged from every student who fills the form. Here's the Examination dates and complete routine shared by the University. Direct link to download the routine is provided, so don't forget to download it to your Mobile. Update - Looks like the Apply online link is not live yet. Once it will be live, I will update it in the above mentioned link in table. Meanwhile, all you can do is wait. Thanks ! Update (25 Nov 2017 - 07.00 A.M) - Apply link is now activated. University has finally released a notification in which apply online link for LNMU PG Semester 2 Examination is live now. Interested candidates can noe fill their application by clicking on the link from the above table. After that, Here's a list of the examination centers in which the examination will be conducted. In all the 4 districts which are under LNMU Darbhanga, 1 center in each district is chosen. In this section, I will try to guide you in applying your online application for Semester 2 Examination 2017. If you are a regular student, I.D.R no. is required and University roll number is required for Ex-Regular students. So, keep it handy while applying online. Also, a scanned passport size photo and signature will be required. First of all, click on the Apply Online link from the above table. Now enter your I.D.R number if you are regular student and University roll number if Ex-Regular. Click on 'Search' now. On the next page your details will be opened. Now fill the asked details there and upload your passport size photo and signature. Fill all other fields and proceed to Payment. Make your online payment and you will get your receipt. That's all. Keep that receipt for future references. Note :-After payment there will not be any option of editing in the application form. So take care of it while filling your details and fill them very carefully. 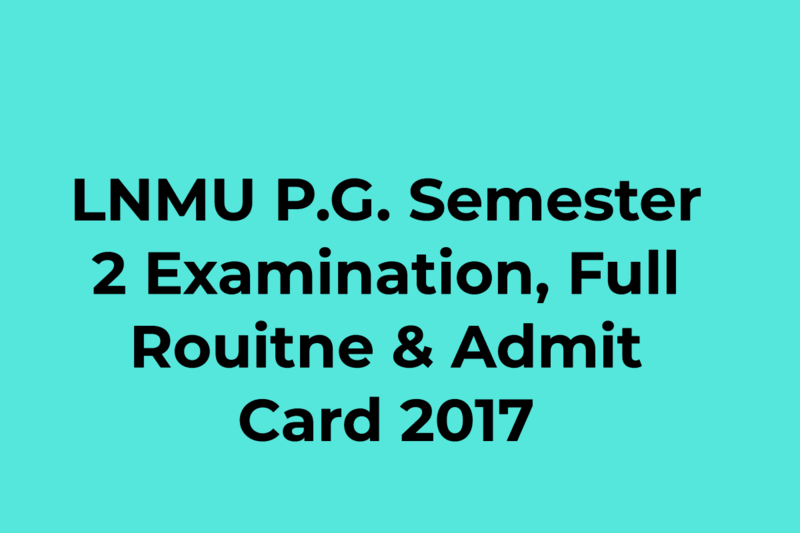 So, after these details, you must be looking for the Admit Card of LNMU PG Semester 2nd 2017. Well, as the Examinations are from 8th December, it can be expected that Admits cards will be released from 5th December and it will be available online so the candidates can get it within time. Admit Card of LNMU PG Semester 2 is now available to Download. Click on the link from the above table and download your admit card. There's no update of downloading admit card but I will update it section if there will be something new and recent from the University. Till now, all you can do is wait. So, that's all on this topic and I hope I was able to clarify the things for you related to the LNMU PG Semester 2 Exam and the updates related to it. I will be updating all these information time to time whenever there will be something new to share.Feel free to drop your queries in the comment section and I will surely get back to them. Apply online link is not published from University yet. Please wait for the apply online link. Can someone let me know what is the practical or viva date for PG Final exam session 2015 to 2017 in LNMU? Last date for exam has been scheduled as 8 Feb.